Is Trump wrong to cut off aid to Pakistan? Is Trump wrong to cut off aid to a country that has supported the Taliban for so long? 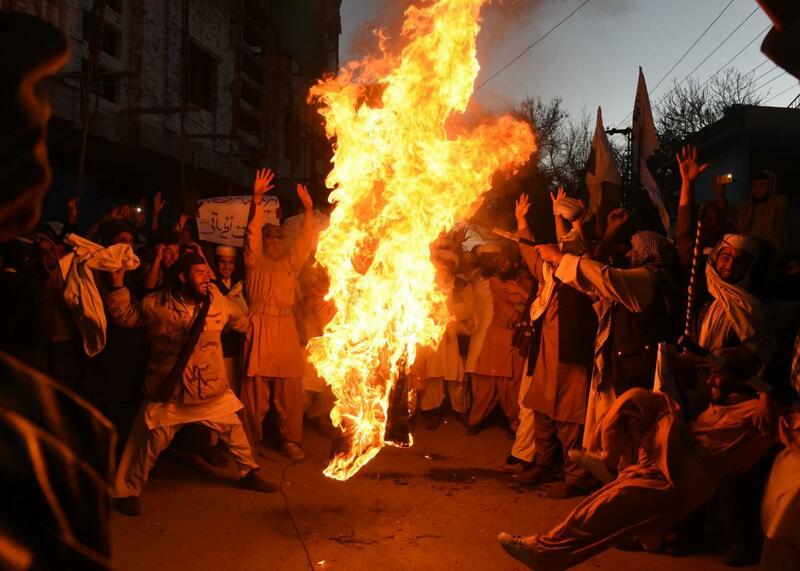 Pakistani demonstrators burn the U.S. flag at a protest in Quetta on Thursday. On Thursday, several days after aggressive tweeting by the president, the Trump administration announced that it was suspending most of its security aid to Pakistan and putting the country on a watch list for its violations of religious freedom. This comes after the United States had already delayed State Department funding to the country. Several months ago, however, America increased the number of troops in Pakistan’s neighbor, Afghanistan, a decision that would appear to run counter to today’s, given that the United States relies on Pakistani supply routes and military assistance in that conflict. The source of American anger toward Pakistan is that, despite its help in America’s war on terror, the country has played a so-called “double game,” continuing to support Taliban factions—Pakistan was the crucial, initial supporter of the Taliban before 9/11—and other militant anti-India groups. The fact that this policy has backfired on the Pakistani people, who have suffered extremely heavy losses due to terrorism since 9/11, has not severely affected the calculations of the country’s de facto military rulers, who have long received support from the United States. To discuss what the suspension of aid means for Pakistan and its relationship to America, I spoke by phone with Shamila N. Chaudhary, a senior advisor to the dean at Johns Hopkins School of Advanced International Studies. During the course of our conversation, which has been edited and condensed for clarity, we discussed how the Pakistani government views the president and his administration, whether this move will have any effect on Pakistan’s behavior, and why it is so hard for countries—such as the United States and Pakistan—to have a clear view of their own self-interests. Isaac Chotiner: This move of the Trump administration has already proven controversial, but what’s actually the argument against it given Pakistan’s behavior? Shamila N. Chaudhary: Giving Pakistan military aid is a tool that Americans have used to get access to the military. It’s not aid just for the things that they need to buy with it. It’s really a tool that gained us access to have an audience with the Pakistani military, and we used that audience to send more U.S. military officials to be embedded with the Pakistani military, and learn about the environment in which they work, and to have exposure essentially. That’s how it started. It was also something that gave us another kind of access, which was a physical access of routes through Pakistan into Afghanistan, which is still very important today. So the opposing argument is basically: Why are you doing this? Don’t you still need access into those routes into Afghanistan if you are actually increasing the number of troops like you said? If you don’t do it through Pakistan, you have to do it through Central Asia, which is a lot more expensive and requires balancing the relationship and dynamic with Russia, which opens up this whole other weird can of worms. The Obama administration didn’t want to deal with Russia and only did it for a certain amount of time. So I guess you could argue that, because of the Trump administration’s relationship with Russia, they see this as not really an issue, because they can get the material there. This is the No. 1 issue: How are you going to support the war in Afghanistan now? The pickle seems to be that to accomplish objectives in Afghanistan, America needs Pakistan’s help. But it’s been 15 years, and along with America’s mistakes, every credible report about what has gone wrong places a lot of blame on Pakistan’s behavior. It just seems like we are a hamster running on a wheel. Right, and in fact, they have moved on. They are not a hamster running on a wheel anymore. They know what they want, and part of what they want is to maintain relationships with the Taliban, because they know that is a group that is vital to their national security. They started doing that back in 2006-2007. We have the intelligence that shows that as well—even as they continued to do certain things for the United States. They have had relationships with the Taliban going back to the ’90s. Well right, but during the 2001-2006 period, when Musharraf’s government was getting a lot of money from the Bush administration, they were not as actively involved in the facilitation and indirectly supporting the Taliban as they had been in the past. They laid low a little bit, and then around 2006-2007, we observed some changes in their attitude. We are really behind in terms of figuring out what we are going to do. So part of me doesn’t think this is a bad idea for the United States because it signals that we are also moving on, and they need to take us more seriously too. We have always threatened to cut aid, and we have cut it on and off, but cutting off all remaining security assistance is a big deal. But I don’t actually agree with the whole thing and don’t think that in the long-term it is a good strategy because of our interest in Afghanistan and the region as a whole. We need to figure out a way to have this relationship besides threatening to cut off aid and cutting it off until they check some box somewhere. Trump is actually being pretty consistent with the Bush administration policy and the Obama administration policy. Nobody found a good way to work with Pakistan, and that is underlying all of this. We have lots of relationships with other countries where we don’t agree on everything, and we figure out a way to meet somewhere—not in the middle, but somewhere, and we hash it out. It just seems like different postures have been tried. We tried Kerry-Lugar, which was a bill to direct more aid to the Pakistani civilian side. We have tried carrots and sticks. You keep saying “they” about the Pakistanis, and I assume you mean the military. It seems then the best long-term solution, and obviously the United States’ influence is limited here, would be for internal change in Pakistan which caused both a lessening of power within the country of its military, and an orientation away from possible conflict with India as the defining national outlook. That’s another kind of trope that we, as American thinkers on these issues, fall back on in trying to understand how to manage this in a productive, proactive way. Intellectually, it’s true. Yes, if the conflict with India and the dynamic between India and Pakistan were different, and if internal stability and the civilians were stronger, then we wouldn’t be in these issues and it would naturally emerge that the Pakistanis would cooperate more with the United States. But that’s not a reality that south Asia lives in. The Chinese, the Saudis, the Iranians, the Russians, they’re all involved in the region now, and they have been for several years, and they have an active interest in looking at all of these kind of geopolitics and issues that we’re talking about. They’re actors in this now. The United States doesn’t have to be the one to say, “Okay, India and Pakistan, get your act together.” I think there’s a multilateral way of going about this, or bilaterally between the United States and Saudi, or the United States and China. They can start having conversations about the region in a way that actually could lead to something more productive, but it’s going to take a long time, and it’s not going to be like the same quid pro quo that we’re used to doing in South Asia and just getting things immediately. All those countries have interests there. You need a whole book to write about, basically, how South Asia as a region is dealing with multiple state powers that are not physically in the region, and how that might be an advantage for the United States moving forward in dealing with a difficult country like Pakistan. I didn’t mean to imply that the U.S. needs to be the one to bring about changes. You’re right, though. Those are the answers. I think that a lot of folks, including Pakistanis often, would go to the United States to do this, because we gave the most money, or we had the most at stake. But guess what? It’s not that anymore. The Chinese have a lot at stake now. The Russians actually have a lot at stake. Saudi and Iran have a lot at stake too, especially because of what’s happening in the Middle East and how they’re using South Asia as their strategic bet to engage each other, and Pakistan is smack dab in the middle of that. I actually think that there are more stakeholders now than there were when 9/11 happened, and we should see that as an opportunity. I don’t think the Trump administration is at all going to be interested in doing any of that. That’s not really a priority for them. It’s the opposite. They want to pull out. It’s not, and that’s where withholding the assistance is good only if it’s a mechanism or a means to achieve an end. What is the end? What do people in Pakistani military and political circles make of Trump and how to deal with him? A lot of countries have tried flattery. Some people have tried more aggressive stances. Obviously they think that he’s unpredictable and they don’t know how to interpret all of these different mixed messages, but I get the sense that the Pakistani state as a whole is going to start speaking more for itself and not kind of out of concern for what the United States might think about it. They’re going to become much more forceful in terms of their rhetoric towards the United States, especially because there’s an election coming up, probably in May. It’s almost like it doesn’t matter what they think about Trump, because it has always been about themselves, and it’s even more so in election cycles. They’re going to hunker down. They’re going to double down on their kind of anti-U.S. sentiment and they’re going to focus on their relationship with China. I think that’s really it. It’s pretty simple. They don’t really know who to talk to in the U.S. government on South Asia. There are some good bureaucrats working on it, but they don’t really matter.